Uniquely-designed boar and nylon bristle paddle brush for ultimate shine! 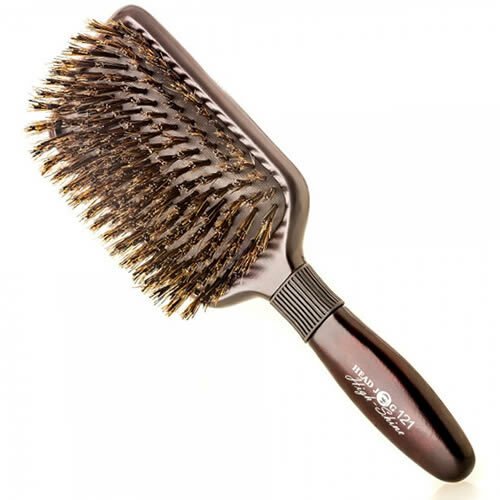 The Head Jog 121 High Shine Paddle Brush forms a critical part of the High Shine range, combining boar and nylon bristles to help your clients achieve magnificently smooth and shiny hair. The nylon bristles have been infused with tourmaline which means they emit ions to eliminate frizz and add shine. Each bristle has also been treated with a high heat flame to melt its sharp end to form a round tip, meaning your clients' scalps get gently massaged as you style. The boar bristles are great for anti-static control, reducing snagging and pulling whilst styling. They also create grip throughout the hair to smooth cuticles and add yet more shine. This terrific paddle brush offers a high heat resistance for professional use. £7.74 (inc. VAT) Why no VAT? We're a trade wholesaler and quote our prices without VAT to help our VAT-registered customers understand the true cost of a purchase.